Budapest deserves its nickname Pearl of the Danube! The city is beautiful and resembles in many aspects to Prague with a mixture of different style of invaders who succeeded to his door. Budapest has an amazing cultural heritage, a mixture of styles deriving their origins from the Roman baths, from the Ottoman emprire the Soviet occupation of Austria ... Several areas of the city classified as World Heritage by UNESCO. The city was formed by combining the spiritual Buda on the right bank and Pest on the popular and industrial left bank of the Danube, mighty river flowing south and the Black Sea. Budapest is a city which has extensive 2.2 million inhabitants, but no buildings disproportionate here instead of buildings on a human scale. Here are our tips for a short visit to Budapest, where you can give between 1 and 4 days of visit. Monument must! As the Prague Castle, the Buda Castle dominates the city's superb. It contains within it the Fishermen's Bastion, Matthias Church (XIV century) where Sissi was crowned Queen of Hungary, the Royal Palace and several museums. It was designated in 1987 as a World Heritage by UNESCO. The view over the Danube and Pest is superb. You can get there by car or bus, we prefer the funicular side of the Danube, or even better a discovery walk in ESCALANDES Hill. At the foot of the funicular which opens at 7:30, take the voice that rises to your left under the arms. Access on your right after a few will take you on a small road leading to the Palais Royal. He leads under the statue of the imperial eagle. Further north of the castle lies the Matthias Church and Fishermen's Bastion. If you are staying in downtown Pest and pull off in the evening, the Basilica of Saint-Etienne can not escape. It houses the relics of the Hungarian Holy Dextre , the mummified arm of the 1st king of Hungary, Stephen. Farther north along the Danube impossible to miss the Hungarian Parliament and its 691 rooms, 268 meters long, 96 meters high, the largest building in the country. Of neo-Gothic style, was built from 1884 to 1904: 20 years of work! The palace is also a World Heritage of Unesco and the Andrassy Avenue and Terms. park, the park of Margaret Island, located on the Danube, you enchetera. Ile is forbidden to drive and has 2 spa hotels and cafes. 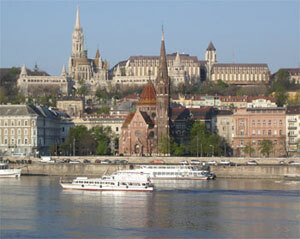 Add to bookmark this page Hungary " Visit Budapest " - Firefox do "Ctrl D"